VPS Cupola LIVE! FLORENCE LIVE! TUTTI I SEGRETI DI CUPOLA LIVE !! The Cathedral or Duomo of Florence as we see it today is the end result of years of work that covered over six centuries of history. Its basic architectural project was designed by Arnolfo di Cambio at the end of the 13th century; the cupola that has made it a symbol for the whole of Tuscany was created by that genius of the Renaissance, Filippo Brunelleschi, while the facade that completed it was carried out as late as the late 19th century. A whole series of structural and decorative interventions to both the exterior and the interior that were to enrich the history of the monument were carried out during this space of time: these range from the construction of the two sacristies to the 16th century marble flooring, and from the execution of the sculptures to the frescoes, signed by Paolo Uccello, Andrea del Castagno, Giorgio Vasari and Federico Zuccari (the Last Judgement in the cupola). The third and last Florence cathedral (the cathedral is always the church that is the seat of the bishopric), it was given the name of Santa Maria del Fiore (Holy Mary of the Flower) in 1412 in clear allusion to the lily symbol of the city. It was built on top of the second cathedral, which early Christian Florence had dedicated to Santa Reparata and which remained in activity for nine centuries, until orders were given to demolish it in 1375: considerable remains of this construction, which was slightly more than half the size of the present basilica and completed by two belltowers, can be seen today in the archeological area underneath the Cathedral. In 1293, the Florence Republic, at the suggestion of the notary Ser Mino de Cantoribus, decided to replace Santa Reparata with a larger and more magnificent cathedral, and was also prepared to finance its construction: "so that the industry and power of man are unable to invent or ever attempt again anything that is larger or more beautiful". The population was expected to partecipate in the costs: all last wills and testaments bore a tax which was then put towards the "Building" of the Cathedral. The project was assigned to Arnolfo di Cambio in 1294, and he ceremoniously laid the first stone on September 8th 1296. The brilliant head architect of the City Council was already revolutionizing the Franciscan basilica of Santa Croce and in 1298 also started work on the construction of Palazzo Vecchio. Arnolfo worked on the Cathedral from 1296 to 1302, the year of his death, and although the dominating style of the period was Gothic, he conceived a basilica of classical grandeur, with three wide naves that meet in the vast chancel where the high altar stands, surrounded in its turn by the "trefoil" shaped tribune (a schematic representation of the petals of a flower?) on which the cupola rests. The planned diameter for this dome was 45,50 metres, just like that of the Baptistery. Thus Arnolfo spent the last few years of his life completing two bays and the new facade, which he only had time to decorate and complete by half: the sculptures (some by Arnolfo himself) were dismantled and transferred to the Museum of the Opera del Duomo when Grand Duke Francesco I de' Medici decided to construct the new facade in 1586. On the death of the architect, the work on the building ground to a halt. New impulse was however given to its construction when the body of St. Zanobius was discovered in 1330 in Santa Reparata. Giotto was nominated overseer for the building site in 1334 but, apart from the fact that he did not have much longer to live (he died in 1337), he concentrated most of his remaining energy on building his Belltower. Giotto was succeeded by Andrea Pisano (author of the South Doors of the Baptistery), until 1348, the year of the terrible plague that decimated the population, reducing it from 90.000 to 45.000. In fact the fresco of 1342 in the Museum of the Bigallo shows us the building at this particular stage. Under Francesco Talenti, overseer from 1349-59, the Belltower was completed and a new project prepared for the Duomo, with the collaboration (1360-69) of Giovanni di Lapo Ghini: the centre nave was divided into four square bays (thus including fewer windows than in Arnolfo's design), with two rectangular lateral bays. The construction was already well advanced by about 1370 and so was the new project for the apse, surrounded by tribunes that amplified Arnolfo's "trefoil". 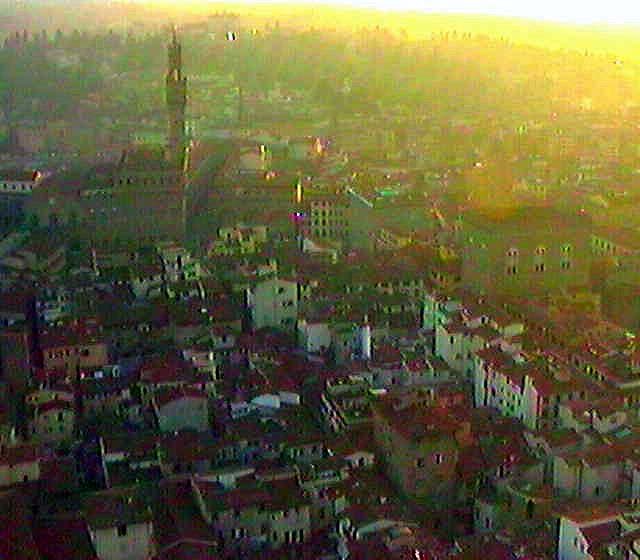 Santa Reparata was pulled down in 1375: a sign that Santa Maria del Fiore was now ready to be the new cathedral of Florence.